Let’s take a look back at some of the fantastic things that happened in the beading world, and here on Inspirational Beading, during the last year of the decade! I started quite a few new segments for this blog, including a new set of interviews based on our favorite beads. My favorite by far is the Wear It Twice series, which allows me to play around with clothes. It’s like dressing up Barbie, but with way more selection, and it all starts with one great necklace! This is my favorite collage of 2010, and I hope to top it many times next year! In February, Miyuki launched the prototypes for their new Tila shaped seed beads. These two-hole 5mm glass squares are a delightful addition to the seed bead family. I’m ashamed to admit that trying out Tila seed beads is on my list of 2011 resolutions. If you’ve already got some in your stash, try out this awesome Square Stitch Tila Bead Bracelet by Caravan Beads. Beading challenges kept me pretty busy this year. At first I thought that making a ring a day was tough, then I lost my mind completely and thought it would be fun to blog a necklace a day. I’ve had to completely rework my storage system to make room for all of the new designs that appeared in so little time. But it was fun! Etsy accidentally rocked the jewelry boat with an ill-advised look at the environmental impact of red coral, hosted by an artist who isn’t exactly a friend to handmade. The beads were flying as many different shock waves of debate and disaster followed. One of the better side effects? Lots of artists in business are now enjoying discounted pro-seller rates at ArtFire. I adore every comment and compliment that readers share on Inspirational Beading. Without fantastic readers and bead lovers, who would I write for? Starting in May of 2010, I picked some of the best blogs from each month’s comments. Here’s the short list of blogs in the spotlight. It's interesting to see how much a blog can change over the course of one year! Assuming you don’t mind the occasional dose of snark, one sure way to get your creativity back on track is to visit Regretsy. It’s been a great year of horrible, odd, and outrageous art! The jewelry category is full of eye-popping designs. So that’s a quick recap of some of my most memorable moments in beading. I hope to have many more in 2011, and I can always use a little help with planning. So I’m taking requests! What kinds of beading techniques would you most like to see for next year’s tutorials? Happy beading, and happy new year! It’s the last day of the year - a time to reflect and look forward. I’ve had a great year, and I’m so glad that I’ve been able to share so many great creative adventures with my fantastic readers. To celebrate the close of 2010, I’ve put together a collection of creations that symbolize all the things we love about New Years Eve. I hope you all have wonderful celebrations of your own, and great plans for 2011. Traditionally speaking, magatamas are unique comma shaped beads, which date back to the Jomon period of Ancient Japan. The word magatama roughly translates to curved jewel, but the exact symbolism of these beads is unknown. Usually carved from stone and gems, they do bear a strong resemblance to Yin and Yang, and are still considered a distinctly Japanese shape. Today, most beaders know magatamas as the delightful glass seed beads with off-center holes. There are two styles of magatama seed beads. Long magatamas have a unique, almost leafy shape, with angled holes at one end. The smaller drop beads have a somewhat pinched shape - they look just like round seed beads that have been pierced too far to one side. Because they perform just like teardrops, but are much more affordable, they are fantastic for bead weaving projects that use large quantities of beads. 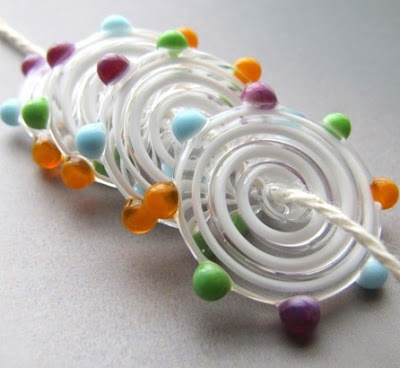 One of the simplest and most fun ways to use magatamas is for adding a hint of texture to a design, like a spiky spiral rope with drops along the center. 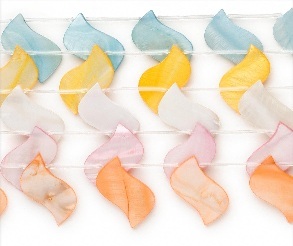 They are also fantastic for fringe and embellishing - a must have bead for everything from stringing to embroidery. 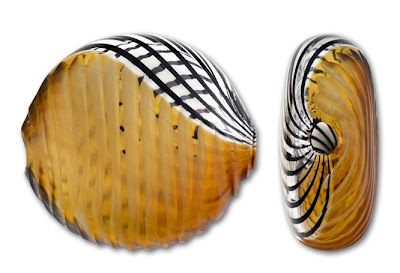 Magatamas come in a variety of colors and finishes, including transparent, lined and frosted. Earlier this month, I asked readers to name which beads they would most like to have by the wheel-barrowful, and the results were almost unanimous. It seems that when it comes to quantity, seed beads and crystals are number one. Considering how many wonderful things you can make with huge lots of them, this makes a certain amount of sense. And wouldn’t it be wonderful to dip your hand into a big barrel of marvelous, tiny beads? I’ve drawn one comment at random, and the winner is Allie, who will soon receive a big package of golden hued seed beads and bugle beads. I hope they can bring lots of new inspiration! Allie’s bead choice was seed beads, with crystal bicones making a close second. 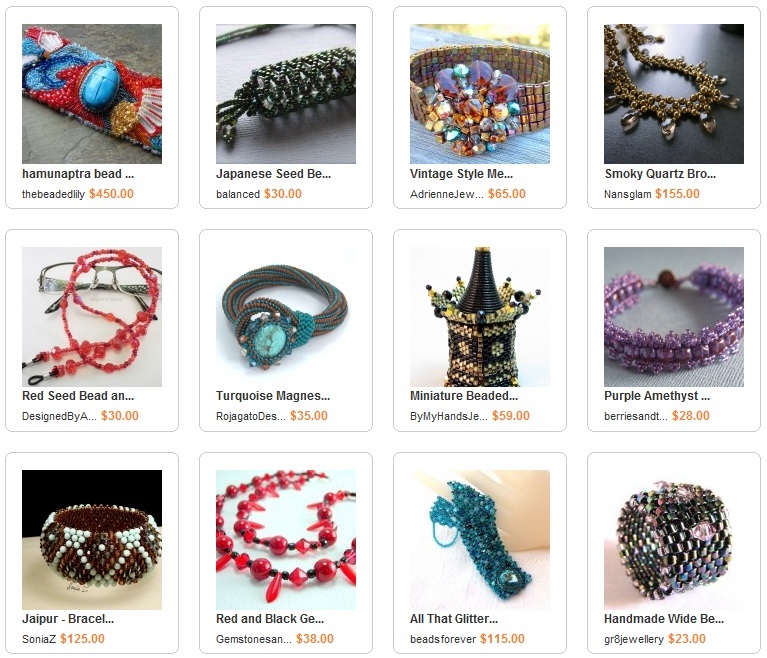 To celebrate another successful giveaway, I’ve put together a fun collection of designs that use seed beads and crystals, with a few fire polish creations, too. Doing crafts and making decorations and gifts together is always a great activity for families to enjoy during the holidays. It’s a great way to pass on a love of art and the goodness of handmade to a new generation, while making memories, too! Step 1: Cut a generous length of soft stringing material like yarn, twine, embroidery thread or dental floss. Step 2: Stiffen one end of the string by wrapping it with a small amount of tape. Cut away any excess tape, and trim the end at an angle to help with passing through the beads. Step 3: String one bead at the other end, and use the tail to tie a few square knots around the bead to lock it in place. If you have a lot of string to fill, roll up the excess into a ball to keep it from tangling. Step 4: Pour an assortment of large beads into a tray or dish in your craft area. Step 5: String a few beads, and show your toddler how it’s done. Encourage him to give it a try. Step 6: Realize that he’s not ready to hold the string and put beads on. Hold the string for him and encourage him to add a bead. Step 7: After a few beads have been added, realize that he’s not interested in putting the beads on. Ask him to pick out beads for you to string. Step 8: Repeat phrases like “What bead should we put on next?” and “Help me pick out a new bead?” while he pushes a toy car around the bead tray and makes bulldozer noises. Step 9: Finish stringing the rest of the beads yourself. Step 10: Tie a few knots around the final bead and trim any excess thread. Step 11: Spend several minutes collecting beads from the floor. Step 12: Decorate the tree with the bead garland and hope that it won’t be pilfered by little hands when you’re not looking. Step 13: Give your helper a big hug! So that’s how it’s done around my craft table. I’d love to hear your funny kid craft stories, too! If you found this tutorial helpful, you might also enjoy How to Wrap a Present with a Cat. Merry Christmas and a very happy holiday season to all of my beading friends and jewelry lovers! 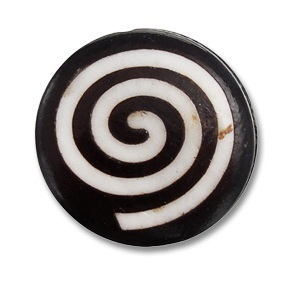 A swirl is a very comforting shape. The organic, liquid flow of things like steam from a mug or bowl of soup, flames in the fireplace, and snow in the wind all have instant appeal to the natural side of our personalities. 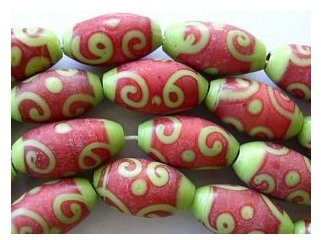 So it’s no wonder that swirl patterns are commonly found in beads! 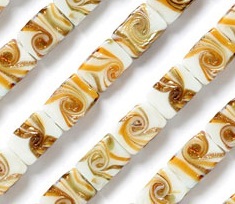 From naturally occurring whorls to handmade swooshes, swirls are a bead’s best friend. Today, I tracked down some sensational beads with plenty of curls and curves. 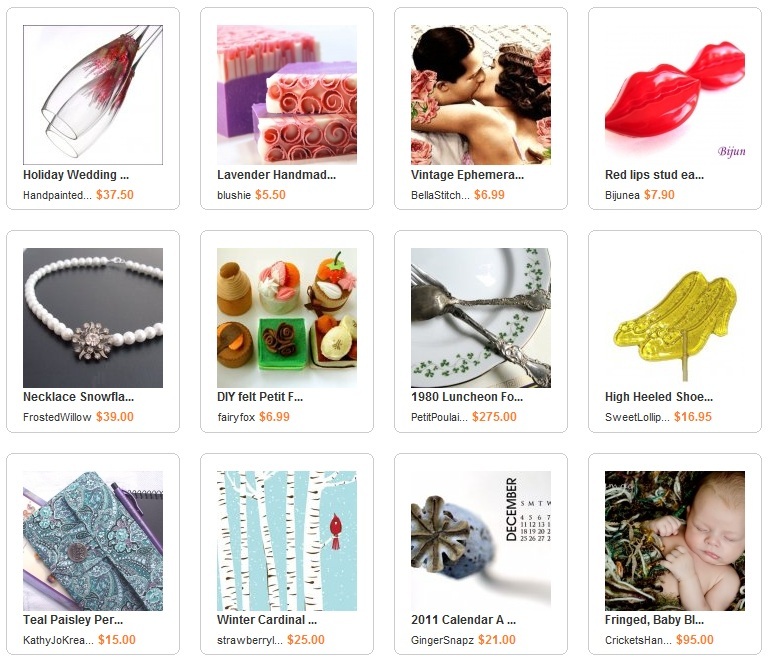 If you take some time to check out any of the beads on today’s wish list, be sure to visit ArtBeads.com and take part in some of their holiday giveaways. Until December 22nd, you can choose up to ten friends to receive a ten dollar gift card to use at ArtBeads. They are giving away $100000 in gift cards to lucky beaders! Plus, if you place an order before December 31st, you could be entered to win a new Apple iPad - a handy tool for bringing your favorite beading tutorials with you to your work station. Before we take a look at some fun winter-inspired color palettes, I’d like to share a quote from Margie Deeb’s recent interview with Lark Crafts. I see so much extraordinary beadwork that does not focus enough on design, but instead emphasizes process and technique. It smacks of “Look how many beads I can use!” or “Look how intricately I can bead!” rather than being an integrated, exquisitely designed piece of jewelry, beautiful in form and function. Whether a piece takes one hour or 30 hours to make, or whether it employs one stitch or 50 techniques, isn’t the point. The overall design of the jewelry is what’s most important: the shape, the silhouette, the wearability, the drape, the visual impact. Coming from an expert like Margie Deeb, these words are music to any beader who has ever questioned their own skills. Being a talented beader or jewelry maker isn’t about having the most elaborate designs. However you choose to create, with whatever techniques, materials and skill, the true test is how much pleasure one of your designs can bring to its wearer. So with that in mind, let’s imagine some wearable designs with simple bead palettes! This month I thought it would be fun to capture the Northern Lights with beads. The phenomenon is a welcome treat in the winter months - the vibrant display becomes easier to see near the solstice, and with short days and darker nights, the effect is even more beautiful. 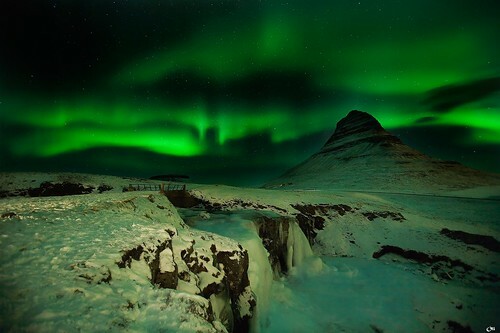 Although the colors seen during an aurora borealis display can include a rainbow of shades like red, purple, and yellow, it is the bright electric greens and blues that we usually think of most. Set against the inky black winter sky, the effect is truly breathtaking. The first palette is called Moon Goddess. 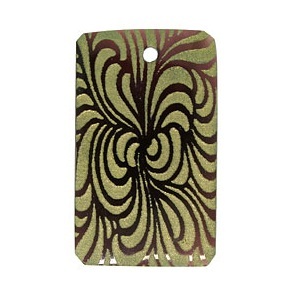 I started with a lime green tagua slice pendant, which has that great electric hue. It contrasts beautifully with blue fire polish, set against a background of jet black 11/o seed beads. Keeping with the astral phenomenon theme, Sky Lights is like a trio of UFOs caught amongst swirling storm clouds. The jet black Swarovski rivolis really stand out against sapphire Miyuki triangles and jonquil lined aqua 15/o seed beads. Finally, we have Blue Eclipse. I couldn’t make aurora borealis palettes without at least some flash, so I paired up black vitrail daggers and green vitrail Czech glass leaves. 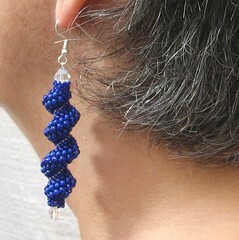 These look great against the moody blue shade of abalone lined crystal TOHO seed beads. 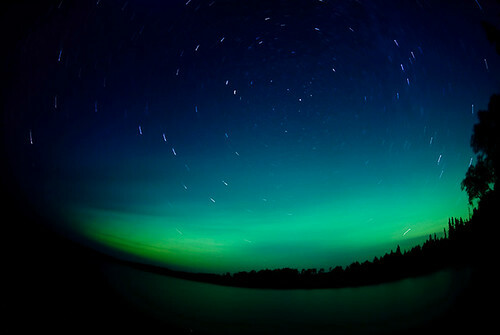 The night sky is such a wonderful source of inspiration. The Northern Lights, the harvest moon, and constellations all have great qualities that can translate into beaded designs. What’s your favorite? If every beader got their wish to be swimming in piles of wonderful, sparkly beads, they might get a new understanding of the phrase “Be careful what you wish for”. Just like having a spectacular art bead that you can’t bear to part with, large quantities of seed beads or accents can become like baggage. They leave you wondering if you’ll ever find a way to use them all. During my necklace a day challenge, I tried to make a big dent in my almost half pound stash of dark gold bugle beads. I suppose I underestimated just how many of these beads I had, because even a 10 strand necklace didn’t reduce them by much. It occurred to me that I might be finding ways to use these beads until the end of time! Well, instead of letting them loiter about in my bead stash, I thought it might be time to pass them on to a beader who has a bigger passion for bugles than I. The color is really fantastic and pairs up well with blues, greens and neutrals. If I was a little more ambitious, I would have loved to see them all go into one fantastic project, like Perie Brown’s woven bead scarf. And since pairing up beads as a gift set is almost as much fun as creating with them, I’m giving these away with matte and silver lined gold bugles, and galvanized metallic gold 11/o Czech seed beads. As a palette, I think they’d be great for home décor projects like beaded curtains or lampshades. what kind of beads would you pick? If you do not have a Blogger profile with email enabled, be sure to leave a contact method such as a link to your shop or website, or a no-spam email address like beadlover AT yourmail DOT com. This giveaway is open to residents of Canada and the US. One lucky winner will be chosen at random and announced on December 27th. During the winter months, color is a little scarce out in nature. Most of the leaves have gone, and the flowers are sleeping away the cold months, waiting for spring. So it’s no wonder that the few hardy plants still around, like holly and mistletoe, make for fantastic holiday decorations. Berries are a wonderful inspiration for beadwork, since their round shapes are easy to imitate with beads. 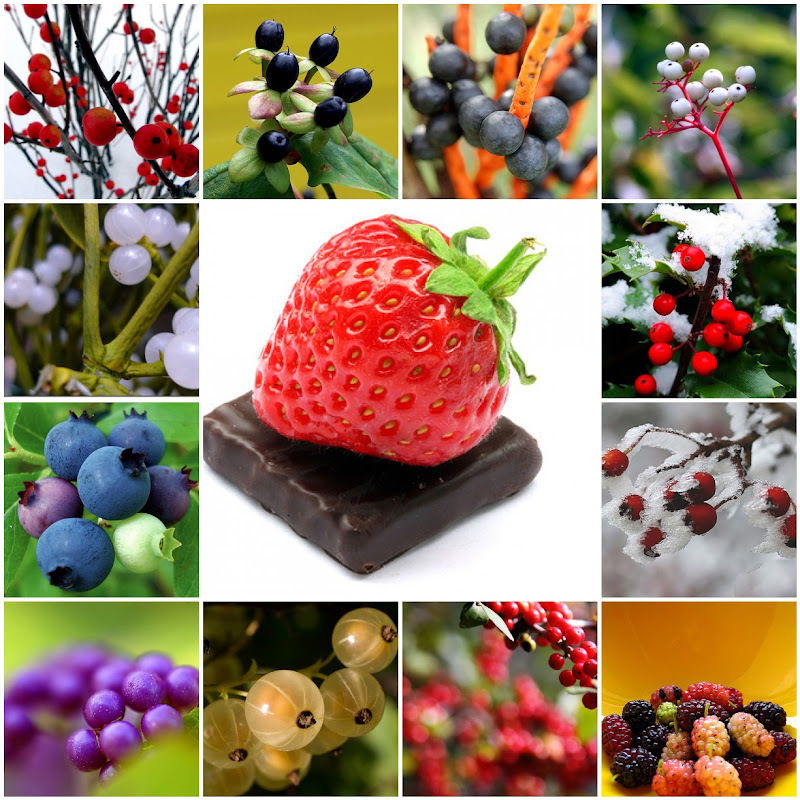 Today I have a collection of colorful berries to share, which might just inspire some juicy beaded designs. 13. i can taste summer! a.k.a. childhood summer! a.k.a. childhood reminiscence! a.k.a. those were the good times! When holidays come around, even the most casual beaders are hauling out their supplies to stitch and string beautiful ornaments and gifts made from beads. You can’t beat the sparkle of beads on a Christmas tree, or the personal touch of a handmade piece of jewelry. But when it comes to giving a unique gift, beads can do so much more! 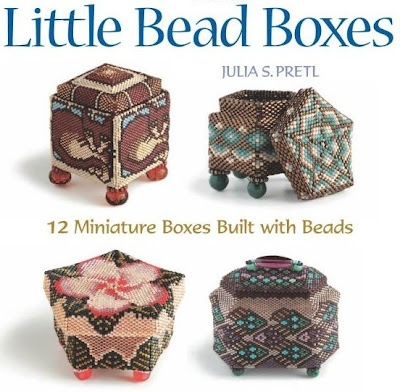 Little Bead Boxes by Julia S. Pretl is an absolute delight for the beader who asks “What else?”. If you’ve ever felt even slightly bored with the same old designs, this book will open up a whole world of weaving possibilities. Using delicas and simple variations of peyote stitch, Julia shows beaders of any skill level how to sculpt amazing little containers for trinkets and treasures. These beaded boxes are irresistible - they somehow capture the very essence of what makes beads wonderful, and transform it into compact creations with unending interest. There are 5 basic box structures to learn, listed in order of difficulty - triangle, hexagon, pentagon, square and oblong. The instructions are broken up into sections, with the more complex box bases described first. Once the bases are created, simple tubular stitching is used to build up the box, which can be finished with several different rims and lids. The stitching directions are incredibly easy to follow, with big, clear diagrams of each step to guide you. Most beaders will recognize the very simple peyote technique used, but the tiny variations in the weave create the most incredible shapes and structures. The tutorials also include steps to add bead feet and finials or handles to finished boxes, followed by full patterns for twelve different boxes. Each pattern includes color diagrams and a word chart with delica numbers, so you can recreate each of the fun designs. Little Beaded Boxes is perfect for beginners and experts alike. Once you’ve mastered the techniques behind a simple beaded box, you can challenge yourself with some of the tiered and embellished designs. 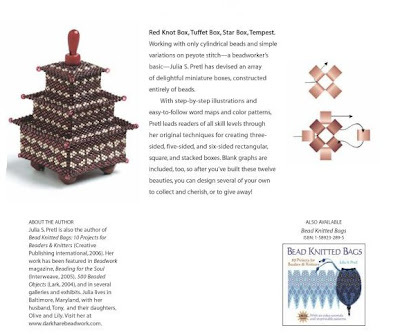 The book also includes blank graph templates, so you can create your own unique patterns for one of a kind beaded boxes. I am oh-so tempted to start creating my own beaded boxes for Christmas presents this year, but I know I’ll be too smitten to part with them! Perhaps they can be this year’s gift to me. Just as there are a million and one ways to weave beads together with thread, the design possibilities for wirework jewelry are endless. From simple charms and dangles, to elegantly wrapped pendants, wirework jewelry has instant appeal for bead lovers. The sister design team behind 123 Little Indians creates wonderful jewelry, drawing on their Blackfoot heritage and combining it with modern materials and techniques. Today, Lindsey of 123 Little Indians shares some insight into this fantastic medium. Inspirational Beading: What is your all time favorite beading or jewelry technique? Lindsey: My favorite jewelry technique is using wire. I started out making charm bracelets, and now I make complete necklaces and rosaries using wrapped loops. I am learning everyday how to improve my craftsmanship. Wire is such an interesting medium to work and experiment with, I am fascinated with some of the things I see on Artfire. Inspirational Beading: How do you first learn to use this technique? Lindsey I learned to use this technique by just picking up a beading magazine and using their "basics" step by step instructions on how to make a wrapped loop. I didn't even have round nose pliers yet - needless to say the loop wasn't too pretty! Ever since then I have been experimenting with wire. Inspirational Beading: Of all the creations you’ve made with this technique, which one is your favorite? 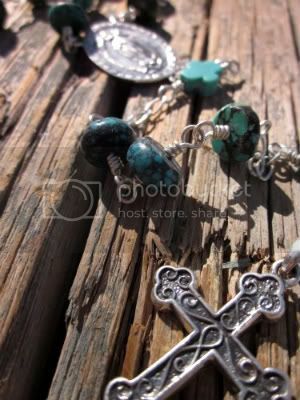 Lindsey: My all sterling silver and turquoise wrapped loop rosary is by far my favorite thing I have ever made. It is more than 11 feet of sterling silver wire, with real turquoise. Inspirational Beading: Can you share any tips for getting started with this method? Lindsey: I can only say you get better with practice. I am most definitely not an expert at any of the art I make. I only focus on doing the best I can while I am making that one creation. I am inspired by the world around me and the beautiful creations I see artisans making everyday. Inspirational Beading: Do you have a favorite material to use it with? 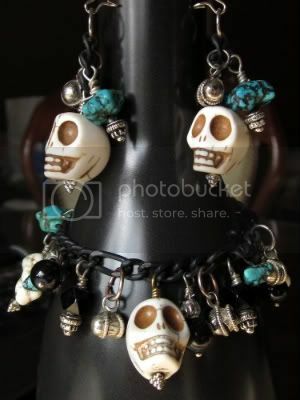 Lindsey: Turquoise and sterling silver are my favorite materials. I have lived in the Southwest almost my entire life, turquoise and silver are everywhere here. 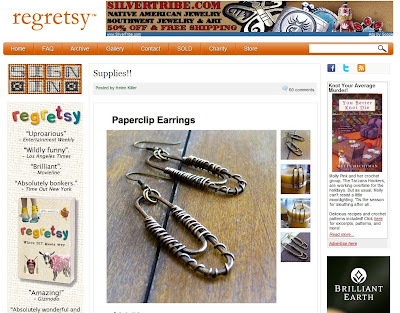 Lindsey: Yes I would recommend learning how to use wire because you are not just limited to one style. Wire can be rustic, fancy, fun, beautiful and funky. You can mix wire with gemstones, crystals, pearls or just focus on the wire itself. Inspirational Beading: In your opinion, what is the best place for beginners to learn this technique? Lindsey: Read, read, read! 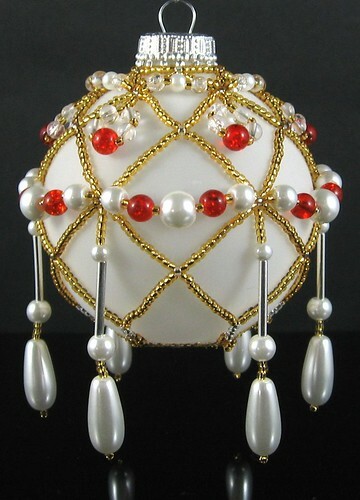 I have so many beading/wire books and magazines like Bead Style and Bejeweled by Claire Aristides. Even if you are not a step by step learner, you can just see the pictures of things that these amazing artists are making and get inspired by them. Your local bead shop usually has classes they offer as well. Quite often, I find myself wondering if I should share more works in progress on Inspirational Beading. After all, some of the best beading bloggers do it. It’s fun to see beadwork through another’s eyes, and take a look at the workspace of a fellow artist. 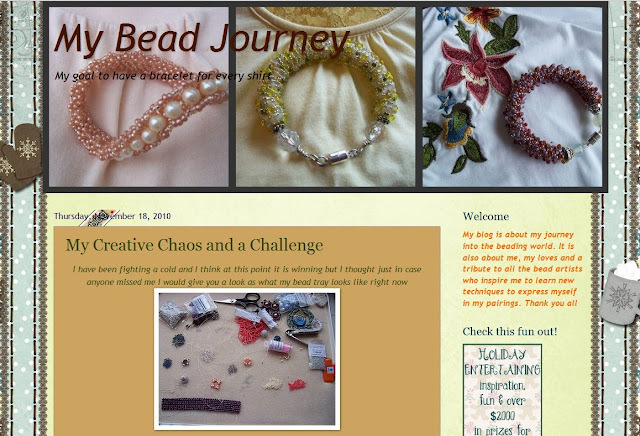 This month, I want to share a really special blog called My Bead Journey, which often gives you a glimpse of a fine beader's studio. Kristen, the author, has a wonderfully friendly voice, and great taste in beads. 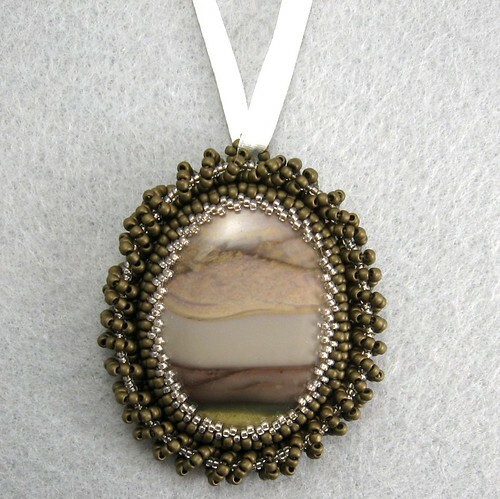 My Bead Journey is always full of inspiration, good humor and plenty of magpie eye-candy. 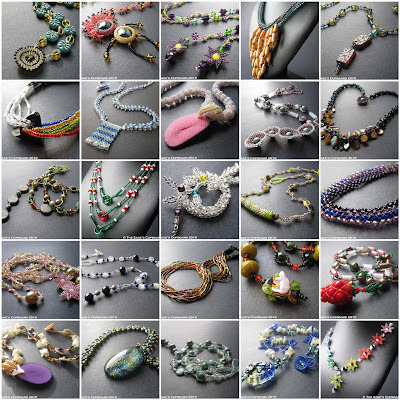 When you’re looking for a fun blog to relax with and talk beads, My Bead Journey is a very safe bet. Kristen often promotes her favorite giveaways, too! Blog Spotlight is a special tribute to my wonderful readers. Featured blogs are chosen from the previous months comments. Thank you so much for reading Inspirational Beading! It’s all too easy to get carried away with Christmas themes at this time of year, so instead of seeking out some distinctly holiday glam jewelry for December, I stuck to birthstones instead. The first blue topaz design that really caught my eye was this gorgeous Cubic Zirconia butterfly pendant. It’s about as far from Christmasy as one could get, so I started building some fun December outfits around it. For those lucky enough to live in climates without heaps of snow and rain in winter, I started with an irresistibly fun Peter Pilotto dress. The splash of orange goes so well with the blue CZ. It’s a fun challenge to combine black and orange together and completely wash away any trace of Halloween. The shapes and textures of this dress have already done most of the work for me. To complete the look, I added Swarovski studded leggings, some furry black boots and a sapphire blue handbag. I thought adding a vibrant orange Tarina Tarantino butterfly barrette toed the line of taste just enough to be sensational. I created the second outfit with the northern hemisphere in mind. 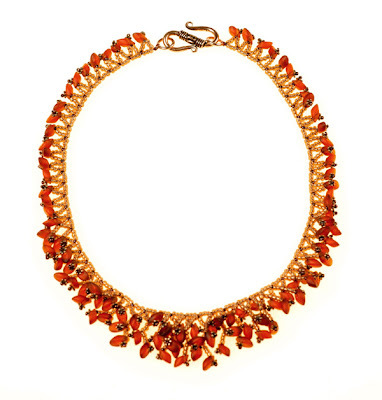 It started with a gorgeous wool turtleneck in pumpkin orange, which has a fantastic cowl neckline for showing off a statement necklace. Dark gray printed jeans and blue Dr. Martins dress it down. To bring it back up again and balance out the butterfly pendant, I added a black and gold bangle watch, and a black knit beret. 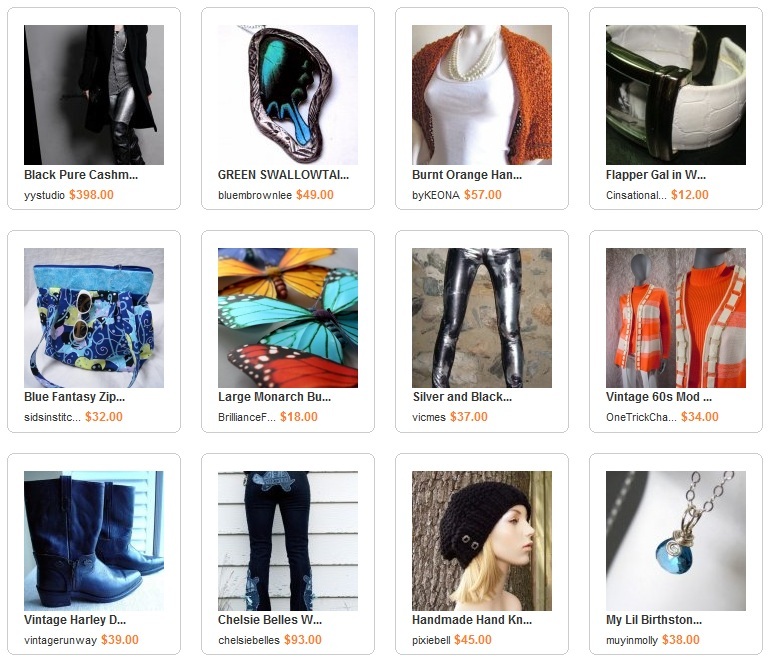 And, of course, you can get these looks, or something like them, on ArtFire. Okay, bring on the eggnog! No matter what we use our beads to create throughout the year, the lure of making ornaments and decorative objects with lots of sparkle often calls out during the holidays. 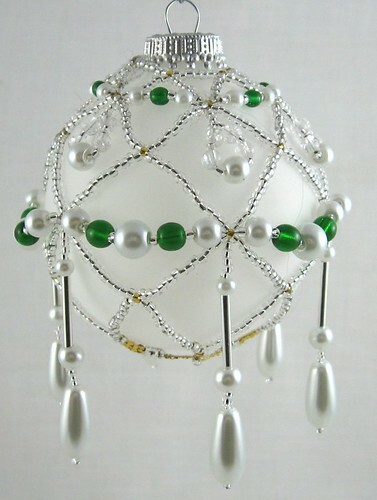 One of the most popular designs is the bead embellished ornament - bulbs of glass covered with nets and swags of beautiful beads. 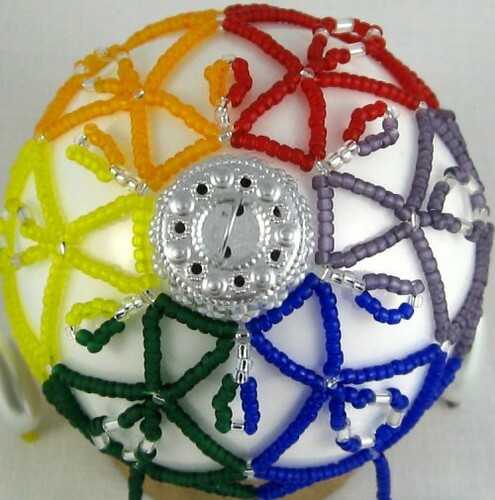 The colorful beaded ornaments at Weaverbird Beads provide plenty of holiday cheer. Inspirational Beading: How did you first become interested in creating with beads? Weaverbird: When I was quite young - before I turned ten – someone gave me a bead loom and a few tubes of seed beads. The loom was the simple wire-frame model that is still sold in craft stores today. Back then (we are talking 50 years ago) it was called an "Indian Bead Loom" and the instruction leaflet included a Thunderbird pattern. I was fascinated! The beads drew me – so tiny and brilliantly colored. I spent many hours absorbed in messing with that loom. Along the way I learned to work from a charted pattern, and got comfortable with the beads. It planted the seed, which then lay dormant for a while. Fast forward 30-some years (years filled with other interests: weaving, photography, sewing, reading, spinning, cars, computers, and a long etcetera). I got interested in beads again when a beading magazine caught my eye. The infinite possibilities of off-loom beading grabbed me and I was hooked. It's been nearly 15 years since then and beads have gradually edged out all the competition to become my main creative focus. 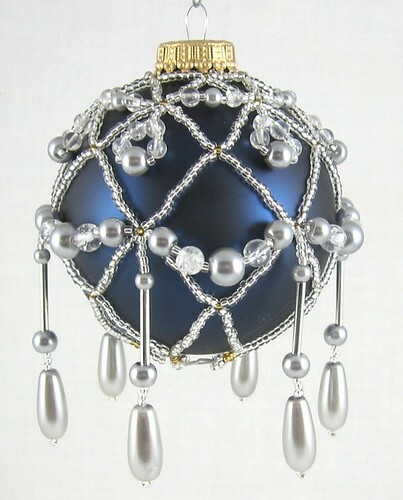 Inspirational Beading: Beaded ornaments are a highly coveted art form, but we don’t often see them for sale. How did you discover a passion for creating these designs? Weaverbird: My mother made many ornaments that seemed magically beautiful to me. She started with glass or Styrofoam balls and applied velvet ribbon, sequins, glitter and gold paper lace to create ornate little masterpieces. So, having grown up with handmade ornaments, it was natural for me to add beads to mine. Ten or twelve years ago, I saw a picture of a stone donut in a net of beads and had a lightbulb moment. What if I could do that with an ornament? Theme and variation is a passion of mine, and ornaments are the perfect vehicle for an endless series of variations. My ornaments consist of two basic elements: the underlying net, which doesn't change, and the embellishments – the swags, loops, dangles and so forth – which do. There is no end to the possibilities for dressing up that simple netted foundation. But it took quite a bit of experimentation before I got a basic net pattern that worked the way I envisioned. My earliest nets were sewn in place on the ball. The flaw is that if the ball breaks or discolors there is no way to salvage the beadwork. Eventually I settled on the design I use now. The net fits the ball securely, no matter how elaborate or heavy the embellishments, but can be transferred to another ball quickly and easily. I've been making ornaments ever since, mostly as gifts for friends and family, and I don't plan to stop any time soon. Hard to imagine ever growing bored with them! Inspirational Beading: What is your favorite holiday color palette? Weaverbird: I love the classics – red, green, gold, silver, plus deep blue. There's something about deep jewel tones and metallics that feels festive to me. Shiny gold beads paired with red or green evoke firelight and candlelight glinting off polished surfaces. They are the indoor colors of the holiday - all about warm, cozy spaces polished and decorated for the occasion. While silver paired with deep blue reminds me of a winter night - the sky full of stars and the moonlight striking sparks off the snow. Those are my favorite combinations, but I like to mix them up, too. And really, you can't go wrong pairing either silver or gold with any of those hues. 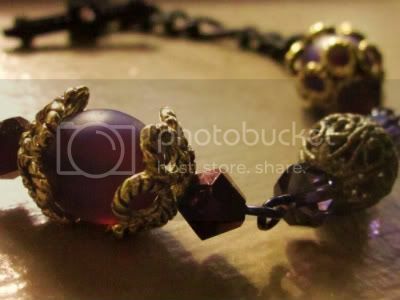 I also like to throw in a bit of amber and purple now and again. And, of course, rainbows – there are always rainbows. 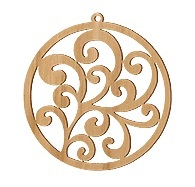 Inspirational Beading: Any plans to sell ornament tutorials in the future? Weaverbird: I hadn't thought about it until you asked, but yes, I would like to do that! In fact, I have the beginnings of a tutorial already done. Last year I wrote and illustrated a set of instructions for the basic net for my brother in law, who has asked me to teach him. With a little tweaking it might be ready for a wider audience. Weaverbird: Oh, good question. I'd love to inspire anyone who has looked at a beadwoven piece and wondered if they could learn the craft. I hope my work will be the little extra nudge they need to try it for themselves. Beadwork requires patience and concentration (and good light!) to do well, and there's no denying it's very time consuming, but the first steps are not hard to master. The basic stitches - netting, peyote, herringbone, etc. - are just that: basic. And so much can be done with them! It's thrilling to discover the variety and beauty one can create with just a needle and thread plus a selection of seed beads! There speaks my love of theme and variation again, but it's true; you don't need much to get started. And the payoff is a double helping of satisfaction. The act of creating is enormously satisfying in itself and the finished item adds to that feeling by giving you a long-lasting reminder of the skill and passion you put into your work. On top of the satisfaction, you will have a wonderful work of art to give as a gift or sell or keep for yourself. It doesn't get better than that! Gretchen describes herself as a dreamer, a beader, a maker and a reader. As inquisitive as the Elephant's Child, she is fascinated with how things are made and how they work. This curiosity has led her to sample many handcrafts, and to delve deeply into some. In addition to her passion for beading, she is a weaver of cloth and handspinner. She loves to sew. She has tired macramé, paper-making, cross-stitch, crewel, origami, and more. She has magpie tendencies; she finds shiny, pretty things (beads, stone cabochons and donuts, gadgets, and toys) irresistible. She grew up on a small farm and retains a close connection with nature, delighting in the changing of the seasons and in observing the plants and animals around her. She enjoys landscape photography as a way of recording the natural world. You can see more fantastic ornament designs, along with beadwork jewelry and accessories, and a fantastic handmade blog at Weaverbird Beads on Artfire. To learn more about Gretchen’s work and get the latest news, you can find her on Twitter and Facebook. You can also see some great examples of her designs and how to create your own with: Cellini Spirals - Themes and Variations.